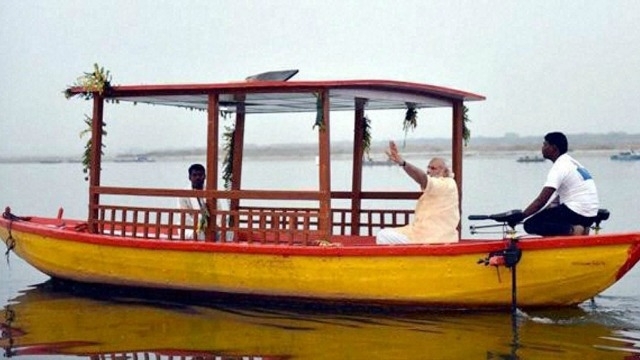 In an attempt to reduce pollution and drive the Clean Ganga mission, the Indian PM Narendra Modi had gifted e-boats to the boatmen in Varanasi. These boats were supposed to run on power supplied by the rechargeable batteries, which in turn would get charge from solar panels. The PM of India is playing a monumental role in promoting solar energy in the country. The solar installations in the country and the funds allocated to solar increased remarkably during the last year. He is trying to do justice to his 100 GW of solar power installations by 2022 in all the possible ways he can. The e-boats are supposed to bring down the daily cost of a boatman, by at least Rs.500 spent on diesel. The Indian PM has a target of replacing these diesel boats with 3,000 medium-sized battery-operated boats in a year’s time. Each medium sized boat can fit upto 10 passengers. Sushanshu Mehta who is the master mind behind this concept, says that old boats were converted into e-boats, by fitting batteries into them. “Tourists will be keen to come and take a ride on Varanasi’s e-boats, will this not boost tourism here? With e-boats,the boatmen will be able to save Rs 500 a day without spending on diesel. They can use this money for their family.” “Whatever money you save, use it for the well being of your children – their food, their education but don’t waste what you save,” Modi urged boatmen. However we here at Greenworldinvestor have always emphasized upon the lack of proper infrastructural facilities, required to promote solar energy in India. The e-boat is a good way to promote solar power and also reduce pollution. However the structure was not properly designed. Each e-boat comes with plastic rudder and propeller which can make the boat unstable, in a windy weather condition. In addition, it will also not be very suitable to steer during a high traffic situation on the river. These e-boats could alternatively be a better option in the lakes or parks which allow boating as a recreational activity. The e-boat does not have a solar panel on its rooftop, because that is feared to make the boat top heavy. The ghats are not equipped with proper charging stations where these boats can be recharged. In order to make this a viable option, the ghats need to have sufficient charging portals. I think the state government should take proper action and bring this point to the PM’s notice. In my view the e-boat is an excellent way to save the dignity of river Ganga and should also reduce both noise and air pollution caused by the usage of diesel boats. Solar energy has come a long way and is getting more and more mainstream each day. The commercial tariff of solar power is now even comparable to the traditional power sources in states like Maharashtra. E-rickshaws are also gaining traction in India. I think e-boats will be a good way to save our precious rivers from pollution. However, proper measures need to be taken to sustain the same in the long run.